Flashback to Thanksgiving 2016: I'm sitting in an office chair adjacent to my Uncle, who's plopped down in a chair of his own. We're researching places to go for my graduation trip, and we've chewed through places like Thailand, Ireland, Italy... finally landing on Spain; home of Dali, Gaudi, and Tapas galore. We had everything mapped out, and it would be my first trip back to Europe since living there for a short time in 2006. I was ecstatic. Almudena Cathedral in Madrid, across from the Royal Palace. Ornate details like this cover tons of the structures in this city. Madrid was modern, fast-paced, and more urban than I would've thought. Reminiscent of New York or Chicago, it was full of hard-working people with places to go and things to see. The food was the best in our trip, and the live Flamenco dancing gave us a taste of the simmering souls of the Spanish. Graffiti was akin to murals in Barcelona— it was on every door, wall, and vertical surface you could find. We fell in love with Barcelona's hidden streets and small pathways. More Scattered Melodies & a row of Vespas, frequently seen throughout the city. We were lucky to take a couple day trips during our time in Barcelona. We got a chance to see some of Antoni Gaudi's revered architecture, including the famed Sagrada Familia, a Basilica Cathedral that has been over 100 years in the making (and still isn't finished). One side of the Sagrada Familia, which was built to reflect the way nature represents Heaven, Hell, and God's word. Gaudi wanted the interior of his Cathedral to remind us of a forest, with columns reminscent of trees and rich colors found in the stained glass. Another of Gaudi's famous works is the Casa Batllo, which was beautifully decorated for Saint Jordi Day (the equivalent of Valentine's Day in the US) when we visited. I mean, how could you not want to live here? Of course, without a doubt, the absolute BEST part of this trip for me was getting to visit Salvador Dali's home town of Figueres and his self-built museum. It was crowded, sweaty, and loud, but that didn't stop me from reveling in his genius. The outside, complete with gold mannikins, eggs, and loaves of bread. The inside, ft. a mural said to describe his life. Staged photo of me taking a photo, check. 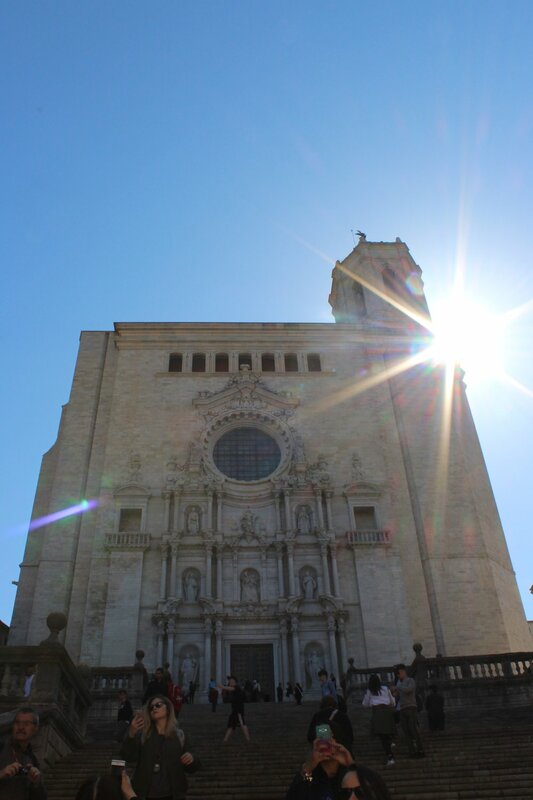 We had a quick trip to Sitges as well as a little medieval town on the way to Figueres. I told you, little & medieval. Supposedly, a Game of Thrones scene was filmed on these steps. I'll get back to you on that. Get your Spanish children's books here. Aka, Dress of my dreams. Our Spanish adventure was everything a young graduate could've wanted it to be. We may have missed the bull fights, but we didn't miss any of the culture, tastes, sounds, and people of these lovely cities. Check out Scattered Melodies at their website here & give their FB page a follow here. For more on our trip to Spain, keep an eye out on a travel diary vlog coming soon.